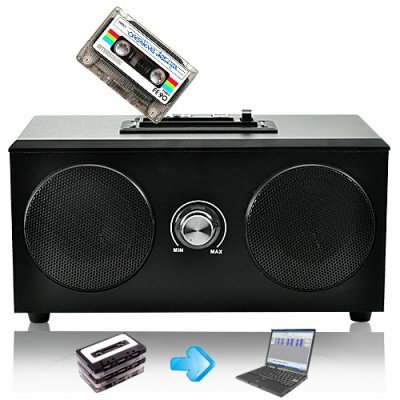 Successfully Added USB Cassette Audio Player (220v) to your Shopping Cart. Transform your old audio tapes into MP3's! Behold and marvel at the USB cassette player that lets you convert all those classic tunes into modern day digital file formats such as, MP3 and WAV. Unlike high street conversion kits that cost an arm and a leg, not to forget their complex functionality, this USB cassette player is simple to use and best of all, it comes with a wholesale price tag. This USB audio deck works straight out of the box, and comes with 2 on-board speakers, as well as RCA audio out for connecting this USB cassette player to your home stereo system. Provided with this USB audio gadget is a software CD containing the world-renowned Audacity 1.3 audio application. After you've installed the Audacity software, connect this USB audio cassette player to your computer using the included USB cable. The Audacity 1.3 software lets you record and edit audio tracks before saving them onto your desktop computer. After you've recorded and saved your music, you can then load the music files onto your iPod or MP3 player and enjoy them on the go. To start recording, hit play on the cassette player, then click the record icon in the Audacity audio application. After you've finished recording, you can then save the recorded audio as either an MP3, WAV, OGG, FLAC or AC3 audio file format. By the way, this USB cassette player also works as a stand-alone cassette player. This USB cassette player comes specifically with a wholesale price, so that you can re-sale this cool gadget on your drop ship website or eBay storefront at the price that you desire. With Chinavasion's worldwide shipping and in-house quality control (QC), becoming a dropshipper or a reseller has never been simpler, and with no contract or special agreement required for selling, the world is truly your oyster! This USB cassette audio player is in stock right now, and available at a wholesale price. Click "Add to Cart now" and once you're at the check out stage, you'll find different shipping prices based on quantity, courier and region for you to select from. Have fun! - Afrikaans, Arabic, Indonesian, Bengali, Catalan, Chinese simplified & traditional, Czech, Danish, German, English, Spanish, Persian, French, Georgian, Italian, Korean, Hungarian, Macedonian, Dutch, Norwegian, Polish, Portuguese, Romanian, Slovakian, Swedish, Turkish, Ukrainian, Vietnamese, Welsh. Will this work with my Mac computer?